Domestic resources mobilization (DRM) is at the core of Financing for development (FFD). Yet, in an increasingly interdependent world, the constraints for DRM are being accentuated and impacted by global externalities and spillovers. These include issues of global regulations and frameworks relating to international tax cooperation, debt sustainability and profiling, combatting illicit financial flows, vulnerability to conflicts and their impacts on neighboring countries, contractual frameworks for PPP, and fair returns from extractive industries in developing countries. The need for a universal inclusive platforms to address these issues is becoming more and more critical to support adequate mobilization of resources for an ambitious and transformative sustainable development agenda with people at its center. 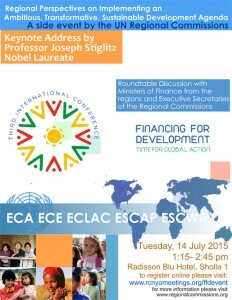 The United Nations is well placed to assume this role.The Side Event was jointly organized by the five UN Regional Commissions (ECA, ECE, ECLAC, ESCAP and ESCWA) on 14 July at the margin of the Third International Conference on Financing for Development (FFD3) Professor Joseph Stiglitz, Nobel Laureate, delivered the key note address to the event which was moderated by H.E. Mr. Hany Kadry, minister of finance of Egypt. Panelists included the ministers of finance of Jordan and Morocco, the senior advisor to the VP of Ecuador and the former deputy prime minister of Australia. The five Executive Secretaries also joined the panel and provided perspectives from the regions. Innovative sources of finance, including through innovative instruments and special purpose vehicles to finance sustainable development. Encouraging cities and subnational governments to take a larger and more pro-active role in mobilizing and accessing resources for sustainable development. The United Nations Economic and Social Commission for Asia and the Pacific (ESCAP) and the Ministry of Finance, Republic of Indonesia will co-host Asia-Pacific High-Level Consultation on Financing for Development on 29-30 April 2015 in Jakarta, Indonesia. The United Nations General Assembly, through its resolution 68/279, called upon the regional commissions to hold regional consultations in preparation for the third International Conference on Financing for Development in Addis Ababa in July 2015. The Asia-Pacific regional consultation aims to assess the progress made in the implementation of the Monterrey Consensus and the Doha Declaration, reinvigorate and strengthen the financing for development follow-up process, address new and emerging issues, the current evolving development cooperation landscape, the interrelationship of all sources of development finance, the synergies among financing objectives across the three dimensions of sustainable development, as well as the need to support the United Nations development agenda beyond 2015. The discussion of the consultation will focus on these key issues, and to highlight priorities and propose recommendations for the Addis Ababa conference to move towards a transformative post-2015 development agenda. The meeting will provide an opportunity for ESCAP member States, associate members and other stakeholders such as private sector, academia and civil society organizations to undertake a policy dialogue, in an open, inclusive and transparent setting, to understand and highlight issues pertaining to catalyzing and mobilizing financing for development at national, subregional and regional levels in the Asia and the Pacific. The Jakarta Consensus (TBC), outcome document of the regional consultation containing discussions and recommendations related to the mobilization and effective use of financial resources in Asia and the Pacific, will be Asia-Pacific region’s input to the preparations and outcomes of the Third International Conference on Financing for Development in Addis Ababa in July 2015. Importantly, the deliberations will significantly contribute to summit in September 2015 for the adoption of the post-2015 development agenda. This policy dialogue will also provide an opportunity to discuss and consolidate some regional specific inputs from the working group on the regional financial cooperation which will be taken up for adoption at the Second Ministerial Conference on Regional Economic Cooperation and Integration in Asia and the Pacific at the end of 2015, and its preparatory meetings are to take place in August and October of 2015. The 8th Joint Annual Meetings of the African Union Specialized Technical Committee on Finance, Monetary Affairs, Economic Planning and Integration and the ECA Conference of African Ministers of Finance, Planning and Economic Development will take place from 25-31 March 2015 in Addis Ababa, Ethiopia. The Conference will tackle the theme, Implementing Agenda 2063 – Planning, Mobilizing and Financing for Development in a Ministerial segment from 30-31 March 2015, which will be preceded by an expert’s segment from 26-27 March. The Conference will be held against a backdrop of intensive activities leading up to the MDGs 2015 deadline and the global negotiations on the post 2015 development agenda. In 2013 the Joint Conference focused on industrialization for Africa’s emergence, and shifted attention in 2014, to inclusiveness and transformative development for Africa. A call was made to African countries to adopt dynamic industrial policies with innovative institutions, effective processes and flexible mechanisms to transform their economies to bring about inclusive and sustainable economic and social development. The format of the Conference will comprise intellectually stimulating plenary sessions, as well as round table debates and side events intended to deepen discussions on the theme. The Conference will also feature the inaugural lecture for the Annual Adebayo Adedeji Lecture Series, launched in Abuja in 2014 and the launch of the annual Economic Report on Africa, which tackles the theme of trade and industrialization. In September 2015, UN Member States will adopt a transformative and aspirational post-2015 development agenda, including the Sustainable Development Goals (SDGs). Its impact will much depend on reaching ambitious agreements and commitments at the Third International Conference on Financing for Development, to be held in Addis Ababa from 13-16 July 2015. Against this background and at the request of the General Assembly (A/RES/68/279), UNECE and the Regional UN Development Group for Europe and Central Asia will hold a one-day regional preparatory consultation, focussing on strategies and instruments the UNECE region has to offer to promote resource mobilization for sustainable development and the implementation of the post-2015 development agenda. 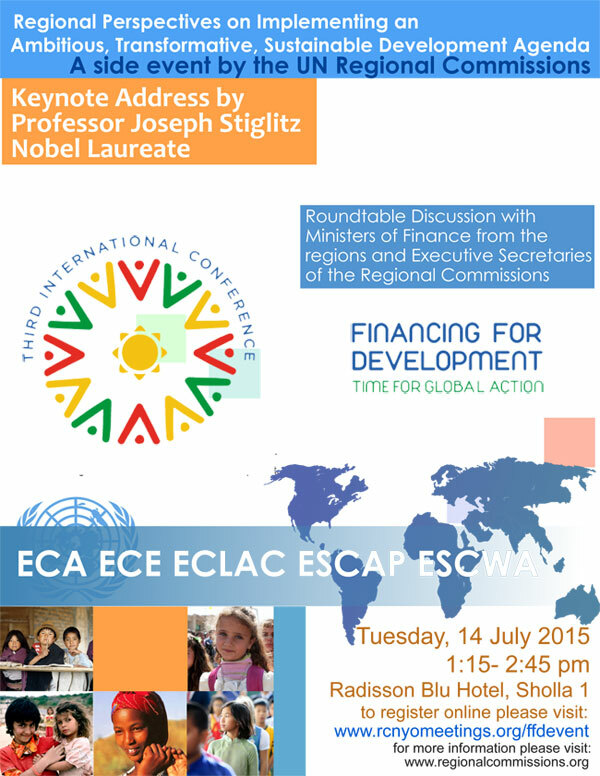 The consultation will take stock of trends and needs regarding financing sustainable development in the UNECE region. It will also discuss solutions to unlock private resources and ways to set conducive frameworks for resource mobilization and renew and strengthen the global partnership for development. The Latin American and Caribbean Regional Consultation on Financing for Development will be held on March 12-13, 2015, at the headquarters of the Economic Commission for Latin America and the Caribbean (ECLAC) in Santiago, Chile. The meeting will be attended by authorities and ministers from various countries in the region as well as senior representatives from the United Nations and other regional organizations, who will address relevant matters in preparation for the Third International Conference on Financing for Development, which will take place in July in Addis Ababa, Ethiopia. The event, organized jointly by ECLAC and Chile’s government, will be inaugurated on Thursday, March 12 at 9:00 a.m. by Heraldo Muñoz, Chile’s Minister of Foreign Affairs; Hongbo Wu, the United Nations Under-Secretary-General for Economic and Social Affairs; and Alicia Bárcena, ECLAC’s Executive Secretary. At the meeting, ECLAC’s Executive Secretary will present some strategic features of financing for development from a regional perspective, on the basis of a new study prepared by the Commission. Also, participants will discuss the extent of progress on the Third International Conference’s final document and they will agree upon future activities related to this global meeting, where heads of state and other senior representatives from the international community are expected to reach an intergovernmentally negotiated and agreed outcome which should constitute an important contribution to and support the implementation of the post-2015 development agenda. The Economic and Social Commission for Western Asia (ESCWA) held a consultative meeting to prepare its member countries for the Third International Conference on Financing for Development. The meeting was held as part of the Ninth Session of the Intergovernmental Meeting on Financing for Development, Amman, 7-8 April 2015.